How to pick the highlights? To pick the best of so many thrilling, glorious, rousing moments? Let alone to pick the Number 1 of them all? Well, I can't whittle it down to a Top 10. I usually can't. So it will be a Top 15 or 16. And it will be two Number 1's. Even that was tough. I actually think there's another that's at least as much a highlight. But I'll put that one at #3 and leave it for the next post. For now, starting at the very top, here's my 2 (very humbly submitted, but indisputably exhilarating) #1 highlights of the Saratoga 2012 meet. 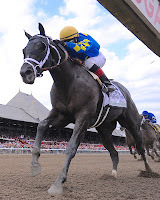 When he won the Hopeful Stakes on Labor Day, Shanghai Bobby showed that he was by far the best of the juveniles to race at Saratoga in 2012. Probably the best 2 year old to race at any track in the country. 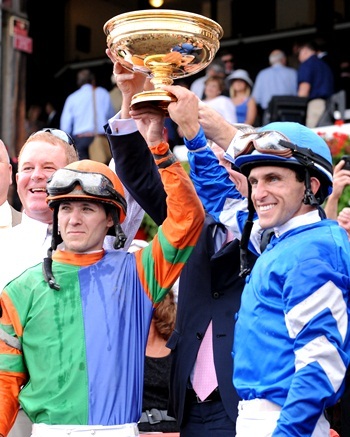 He later proved that he was in fact the very best anywhere when he went on to win the Champagne at Belmont, and then capped his 5 for 5 freshman year with a victory in the Breeders' Cup Juvenile at Santa Anita in November. As expected, Bobby won the Eclipse Award as Champion 2 Year Old last weekend, doing so by a near-unanimous vote of 253 to 1! In the Hopeful at Saratoga, this son of Harlan's Holiday, trained by Todd Pletcher and ridden by Rosie Napravnick, moved to the lead in the stretch. He looked around a bit as he's known to do, and then took off for a nearly 4 length win. 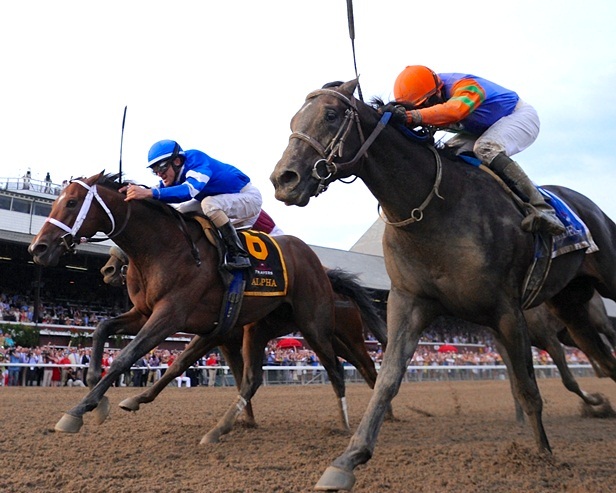 Fortify, Overanalyze, and Bern Identity were among the promising 2 year olds he defeated. 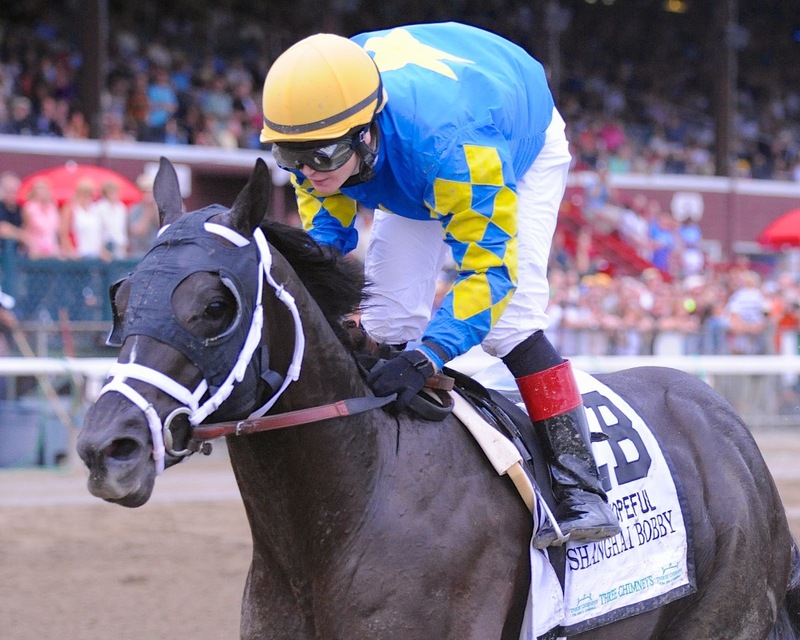 Shanghai Bobby is the early favorite for the Kentucky Derby. Way too early for any confidence. But it demonstrates just how impressive was his juvenile year on the track. For the first time since 1874, the Travers ended in a tie. A dead heat in the 143rd running of the Midsummer Derby, between favorite Alpha and longshot Golden Ticket. 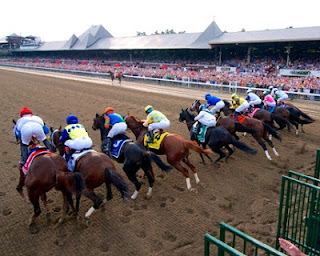 And They're Off in the Travers! Alpha, at 2-1 odds, had a record of 4 wins and 2 runner-ups in 8 starts. The last time out, a few weeks earlier at Saratoga, he won the Jim Dandy. Golden Ticket, on the other hand, went off at 33-1. His record: 1 win, 4 seconds, and 1 third out of 10 starts. His last 2 outings were a 5th at Keeneland in the Coolmore Lexington, and 2nd in an allowance at Churchill Downs. But in the Travers, Golden Ticket, under David Cohen, held on for a share of the lead from a 1 length advantage in the stretch. 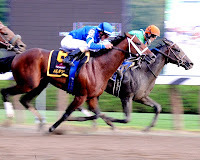 Alpha, with Ramon Dominguez aboard, closed the difference to a nullity by the finish line. 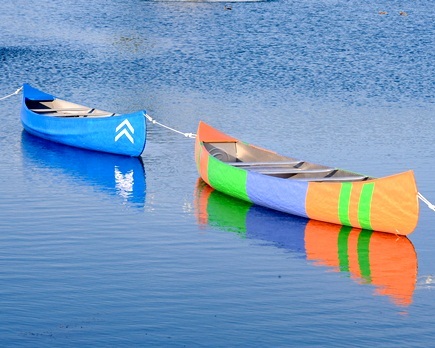 So, 2 winners, 2 winning colors, and 2 canoes on the infield pond. And so, perhaps, it's perfectly fitting that we have begun Saratoga Highlights 2012 with 2 Number 1's. We'll continue in the next post with a few more highlights, including another one or two that could very easily have been #1 as well.